This beautiful rose bush with shapely light pink blossoms and peachy overtones bloom nearly continuously on rounded, slightly spreading shrubs. Each plant is a beauty that is ready to bloom and one that can be proudly displayed indoors or out. 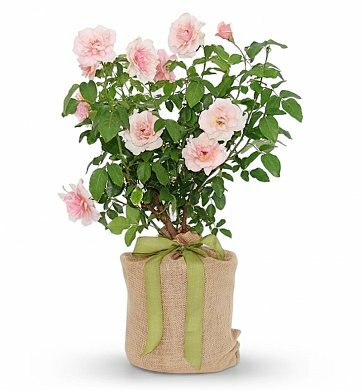 This fanciful blooming rose gift is a hearty grower and meant to be planted for many seasons of enjoyment. One Mother of Pearl Rose Plant. Complete Care and Planting Instructions. Measures Approximately 26" Tall. Size May Vary Slightly. Mother of Pearl Rose Bush is a hand delivered gift. These gifts are delivered by one of our local design centers located throughout the United States and Canada. Same day delivery is available for most gifts when ordered before the cutoff time. The cutoff time for Mother of Pearl Rose Bush is in the recipient's time zone. A gesture of kindness that is long lasting and sure to remind them of your generosity. Mother of Pearl Rose Plant arrives in pot shown. Complete care and planting instructions included. Includes complimentary card with your personal message. My mom loves roses, and the name of the rose is my mom's name, so win-win.